Above: Clockwise from top left: Centennial red wine from Pecos Flavors Winery, Valley Gurlz Goodz pickled asparagus, Lusty Monk Original Sin mustard, Valley Gurlz pickled watermelon rinds, Lusty Monk Burn in Hell mustard, Dr. Field Goods sausage. 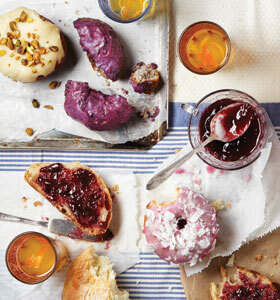 Clockwise from top left: A Death in the Morning cocktail made with Bitter End’s Mexican Mole bitters (recipe on bitterendbitters.com), Whoo’s Donuts’ blue-corn blueberry-lavender doughnut and pistachio cake doughnut with white-chocolate-and-lemon ganache, Red Willow Farms’ chokecherry jelly, Whoo’s cherry coconut doughnut. ALTHOUGH MANY ASPECTS of maker culture flirt with the esoteric, food is not one of them. 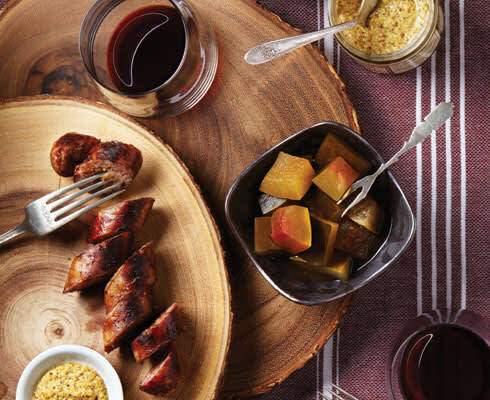 Zesty pickles, fresh doughnuts, and savory sausages are not just delicious—they’re quite approachable. But leave it to New Mexico’s food makers to fold in a few tempting innovations—we’re talking about pickled green beans, chocolate chile doughnuts, and a sausage that counts crumbled corn chips among its ingredients. 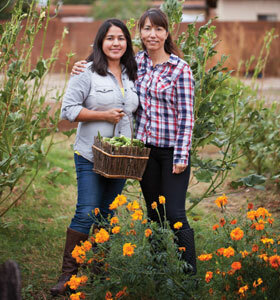 Nurtured by a deeply rooted farmers’ market culture, New Mexico is bubbling with idealistic young crafters of foods that reflect the terroir of our region and nourish the land as well as the eater. New Mexico’s abundance of community commercial kitchens, business incubators and accelerators, and other economic aids have helped a visionary culinary cohort launch small-batch goods. This new generation of entrepreneurs is blazing new trails to market, using social media and other inventive means to reach hungry masses looking for something homegrown, heart-connected, and anything but mass-produced. In this first installment of a two-part series, we’ll meet some of the brightest stars in NM’s new foodie firmament. Cousins Maria Gamboa and Angie Rodriguez “put up” with each other. Angie Rodriguez thought her cousin Maria Gamboa’s pickled green beans were a little weird. Weren’t pickles supposed to be cucumbers? Eventually Maria talked Angie into trying one, and she was hooked. The two of them quickly ate through Maria’s stash and were impelled to order pricey pickled green beans from a New York source to satisfy their cravings. Hmm, they thought, maybe other New Mexicans would be crazy for these too, as a snack and even a Bloody Mary garnish. Fermented foods like pickles are having a big moment, but obviously the method is not new. Fermenting—using salt and time to break down the natural sugars in foods—was one way to preserve food before refrigeration was widely available. Besides enhancing taste, the process creates friendly bacteria that replenish their eaters’ systems. Probiotics do more than improve digestive health; they are also believed to improve mood, reduce cholesterol, and manage weight. When fresh local green beans were available again, the cousins launched a business at the bustling Albuquerque Downtown Growers Market. Angie is from the South Valley, and Maria from the North Valley; hence their business name. The Central New Mexico Community College selected them to participate in its new small-business accelerator program, and paired them with mentors Gene and Jackie Baca, the siblings behind Bueno Foods, an Albuquerque-based brand with national distribution. The Bacas advised them on everything from the basics of the food business to growing a product line and connecting with distributors. One result: Their pickled veggies are now carried by the big-box chain Total Wine & More, where they will doubtless make their way into many, many Bloody Marys. Whole Foods even approached the Gurlz about getting the green bean and asparagus pickles in bulk-size containers for their Rocky Mountain and Southwest stores’ olive bar selections. 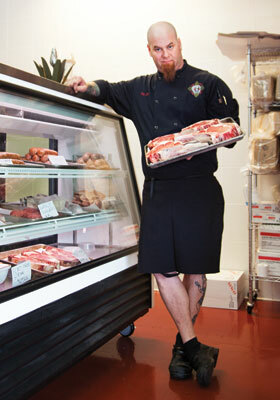 Chef Josh Gerwin cradles a tray of giant local pork chops in his shop. Josh Gerwin’s restaurant, Dr. Field Goods Kitchen, grew out of his food truck; both are known for their bold use of farm-fresh ingredients and edgy, rock ’n’ roll signage. Last year, Chef Josh opened a full-service butcher shop and bakery a few doors down from the restaurant, in the same modest shopping center. The industrial-looking market offers house-made charcuterie, beef aged in-house, fresh meats, breads, and baked goods. “Keep it cold to keep it hot.” That’s the motto of Lusty Monk Mustard, an uncooked condiment with a huge kick, sold in the refrigerator sections of markets. Fresh-ground and full of fire, Lusty Monk is a pretzel’s best friend, and oh, what it can do for a sausage, or a ham or pastrami sandwich. Since 2008, Kris and Steve Monteith have been mixing three styles of small-batch mustards: full-bodied Original Sin, Honey Mustard, and the chipotle-fueled Burn in Hell. The brand’s name came from Kris’s sister, who knew that monks in the Middle Ages were discouraged from eating piquant foods such as mustard, which were thought to arouse carnal desires. Red Willow Farms’ greenhouses produce a year-round crop. 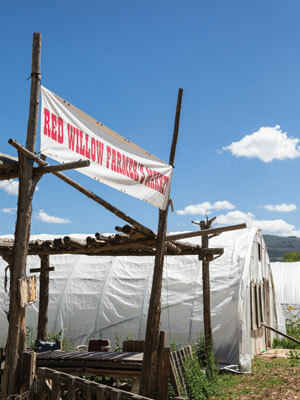 Tangy-sweet fruit jam and jelly are among the agricultural products sold at the Red Willow Farmers’ Market, held Wednesdays year-round on the Taos Pueblo. As a member of the pueblo’s growers’ co-op, Margaret Trujillo makes the fruit preserves after harvesting wild plums and chokecherries each summer, as she has for three decades. Kari and Jeff Keenan discovered that if you glaze it, they will come. During a 2011 road trip, chocolatiers Jeff and Kari Keenan were tossing around second-business ideas when Kari floated this one: artisanal doughnuts featuring local ingredients. Though enthused, they put that idea on a back burner while growing their popular ChocolateSmith business. When Jeff came across doughnut equipment for sale on Craigslist, he decided then and there to purchase it as a surprise to Kari. They’d begun looking for a space in Santa Fe to house the business when, amazingly, just next door to their Railyard-area chocolate shop, a longtime tenant vacated the space. Whoo’s has been a hit ever since. Kari’s brother, Ryan Lampro, manages the doughnut shop and makes the doughs and fillings with one other employee. As Kari planned, many of the doughnuts use New Mexico ingredients: the nuts in their white-chocolate-and-lemon ganache and pistachio number, a blue-corn cake doughnut with blueberry-lavender glaze, and the hefty chocolate cake doughnut with red chile, bacon bits, and toffee crumbles. Bill York helped bring bitters into the 21st century by adding spicy NM zing. This little company has made a big impact on craft cocktails around the world. 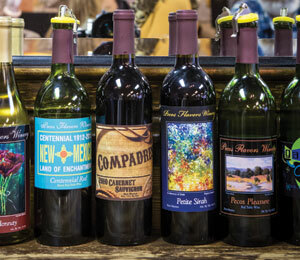 I first came across the bitters in a store in New York and was flabbergasted to see that the bottles said made in santa fe. The line covers a world of flavors: Thai, Moroccan, Mexican Mole, Memphis Barbeque, and more. Each batch is handcrafted by founder Bill York, using blends of herbs, spices, chile, fruits, and other botanicals. Even the labels are applied by hand. Bill uses no preservatives, extracts, or artificial flavorings. Bill has undergrad and graduate degrees in science but moonlighted as a bar manager and bartender. “Exploring and innovating with bitters brought together my geeky and creative sides,” he says. 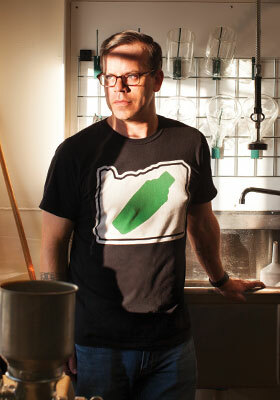 “I first made a simple orange bitters, then decided to distill flavor blends from around the world. I started with Mexican Mole, inspired by a couple of chef Rick Bayless’ recipes for the dish. I steeped the key spices and botanicals in alcohol for two weeks and then fine-tuned my next batch,” before composing the others. Secreto Lounge, at the Hotel St. Francis in downtown Santa Fe, makes a whole line of cocktails that use Bitter End bitters—my favorite is the Basil Thai Gimlet, made with the Thai Bitters. Visit bitterendbitters.com for a list of retailers worldwide.